Are you traveling to an event, conference or trade show in a shuttle bus? If you are looking for an easy and convenient way to promote and advertise your business, brand or another message, vehicle wraps are the perfect answer. Bus wraps are a fun and unique way to raise awareness, excite your team and much more. These wraps look professional and reach a wide amount of people, as everyone passing by will see it. 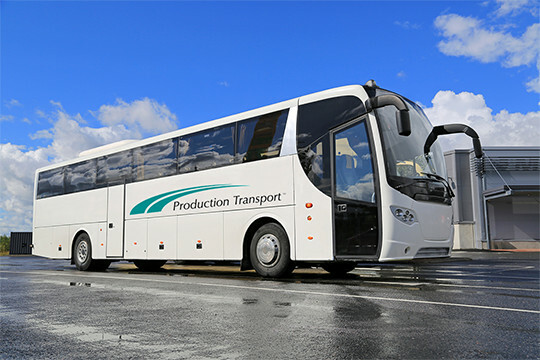 At Production Transport, we are happy to help you find the right type of transportation for your group. We offer a convenient and easy shuttle bus service to move people from one location to another. Whether you have a convention, trade show or another event coming up, our shuttle bus and VIP transport services are the best solution. If your executive needs VIP transport, we can provide a limo service or town car service, which includes an SUV or a sedan. We are more than happy to have been providing outstanding shuttle bus service since 1982. Our number one priority is making sure that you feel confident and comfortable with our service. To ensure that you and your team has a safe and happy trip, we do a very thorough job of planning all the details and coordinating your transport schedule so you don’t have to worry about a single thing. Ready to obtain convenient and unique bus wrap?